These are my go-to breakfast potatoes that turn out perfectly every time! There’s nothing fancy about them, just simple flavorful potatoes that pair perfectly with breakfast! Sometimes I sit here for way too long, trying to think of new recipes to try, all the while, forgetting that I have yet to share some of my most basic, but trusted go-to recipes! This recipe for Perfect Breakfast Potatoes is one of those recipes that I almost overlooked sharing with you, yet I cook quite often. When it comes to breakfast potatoes, there are usually a few options.Some people like the shredded hash brown variety (or this addicting Hash Brown Casserole!) while others like their potatoes chunky. Truthfully, I haven’t met a potato I didn’t like, but homemade shredded hash browns can be a little fussy to make. These potatoes are far from fussy, and turn out near perfect every single time. So what goes into Perfect Breakfast Potatoes you ask? The trick is to start with pre-cooked potatoes so that your only goal is to simple brown them up and make them all crispy and delicious! 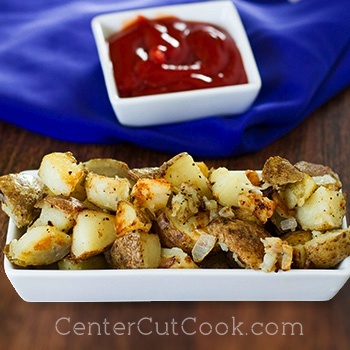 If you’ve got leftover baked potatoes, this is an ideal use for them! I typically don’t have leftover baked potatoes sitting around, so the days when I want to make these potatoes, I simply pop a few potatoes in the microwave and cook them that way. It’s quick, and easy. Once the potatoes are cooked, I chop them up into 1 inch chunks, and then they’re ready to go. About 10 minutes sautéing in a pan with a little onion (chop it coarse or fine dice, whichever you prefer) and some seasonings, and you’ve got simple but Perfect Breakfast Potatoes begging to be eaten! Yes, there is ketchup in the picture because I am one of those that must dip my potatoes! With or without ketchup, I hope you enjoy! Begin by baking your potatoes – I typically do this in the microwave. After scrubbing the potatoes, I poke them a few times with a fork and cook them in the microwave until fork tender which takes about 12 minutes in my microwave but will vary. When the potatoes are cooked, allow them to cool for a few minutes, then chop them into 1 inch chunks. In a large skillet, heat 1/2 tablespoon oil over medium heat. Cook the onion until translucent, then remove the onions from the pan unless you like them crispy, in which case you can leave them in to cook with the potatoes. Add remaining 1 1/2 tablespoons of vegetable oil to the pan and turn the heat up almost all the way. When the oil is hot, add the potatoes in a single layer. Once the potatoes are in the pan, don’t touch them! Allow them to cook for 5 minutes, or until the bottom is nice and crispy, then use a spatula to flip the potatoes. As the potatoes are cooking, season with salt, pepper, garlic powder and onion powder. Continue cooking the potatoes until they are crispy and golden brown, which should take about 10 minutes. Stir the onions back in and serve immediately.